Supertech Cam Followers / Lash Caps - Pann Auto Performance - San Diego largest aftermarket automotive performance parts - What do you drive? Supertech buckets are designed using the latest CATIA CAD software along with Finite Element Analysis (FEA) to ensure the utmost performance and durability under the most demanding racing conditions. Utilizing these methods to analyze the stresses associated with the off centered application of loads enables us to maximize the strength of our buckets while reducing weight. Supertech ensures that each and every part is manufactured using only the highest quality materials, strict tolerances, and high quality coatings. The end result is an undeniable improvement in durability and performance that cannot be compared in any sense with less expensive, extruded or factory supplied lifters. So regardless of your racing applications… whether it is road racing, drag racing or endurance racing Supertech buckets are engineered to outperform the competition to a degree that can only be found in Formula 1. Aerospace certified Chrome-Molybdenum-Vanadium alloy from Austria. This is a much stronger material than the alloys used in OEM extruded lifters. Completely CNC machined from heat treated billet provides only the necessary and calculated thickness of the walls with very special shapes, providing better rigidity with an important reduction in weight. The lifters are fully Nitrided and polished to harden the surface to about 60Rc for low wear. 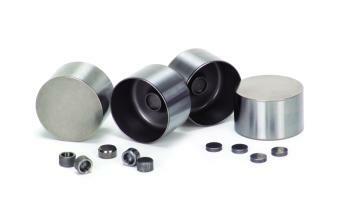 Higher cam lifts and rpms will submit conventional lifters to be susceptible to increased wear. Surface is carefully finished by grinding it to a much lower surface roughness for lower friction with the cams and cylinder head bore, providing improved durability.